This course closely examines various Canadian blues texts, jazz texts, and hip-hop texts read through the lenses of cultural theory, resistance, aesthetic practices (musico-poetic), and questions of Canadian multiculturalism and citizenship. For example, jazz performances provide formal models for numerous writers and theorists to approach the complex interweaving textures and soundings of Canadian culture and community. The writers the course looks at are George Elliott Clarke, Esi Edugyan, Wayde Compton, Dionne Brand, K’naan, and some “abbreviated” readings, critical theory texts, and music recordings. Aside from the reading of the texts, there will be a fair amount of direct listening of the musical material, which comprises key intertextual soundings in the texts themselves. In some ways these texts demand not only to be read but also heard. We will explore questions of historicity, autobiography, gender, race, form and production, crossing disciplinary as well as media boundaries, as we attempt to theorize the activity of listening and re-writing that informs the hybridizing, conflicted and assimilative work of culture, poetry, and music, primarily within a Canadian context. These texts are engaged with the communities from which they write and respond to, and they are largely concerned with the task of changing society. 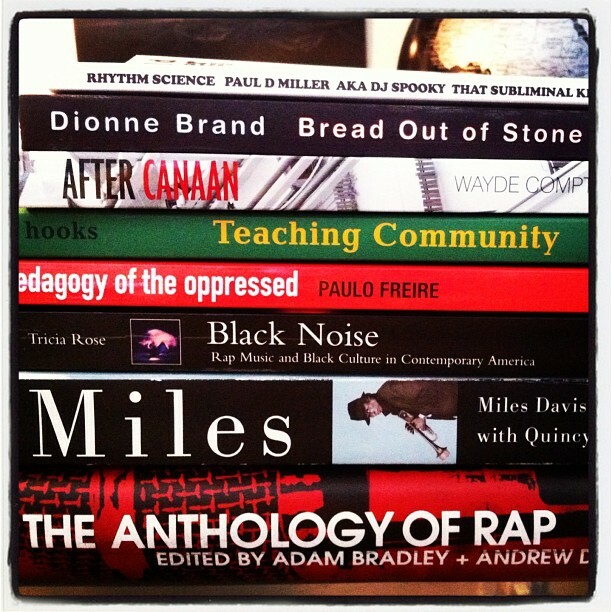 By looking at citizenship through the lens of music in poetry as an often dissonant site (or text) of struggle and identity formation, the course aims to show that music in African Canadian poetry is not solely aesthetic, but a form of social, ethical, and political expression with the intent to challenge social norms, provide critical interventions, and often enact social change. Ultimately, this course will offer you innovative ways to reflect and engage with how we fundamentally interpret texts, as well as how we understand social movements, popular culture, and broader struggles for social justice, particularly as articulated by the writers explored. Additional readings and music will be available in courselink (on reserve) or found online. Method of instruction: Student-led seminars, with the occasional short lecture. There will be 12 in-class writing assignments, but only the top 10 marks will count. See the syllabus for when these writing assignments take place. We will spend around the first five minutes of a given class on these and they are intended as daily prompts to test students’ ability to critically engage with the text or texts assigned for that day (prompts for days on which secondary and primary materials are assigned will ask you to think about intersections between these texts). Each assignment is marked out of 10. Please note that your grade is based on quality rather than quantity. Please take time to formulate your ideas rather than writing for the sake of writing. All in-class writings are open book unless otherwise specified by the professor. Your first assignment begins now. Your task will be to provide a close reading of one of the following poems from George Elliott Clarke’s Blue: “Negation,” “Calculated Offence,” or “Onerous Canon.” You will provide a close reading of the poem you choose. Given the short length of the assignment, I am looking for attentive readings of the selected poem. Please do not use any secondary sources. To prepare we will do a close reading (or two) of a poem from Blue with further instructions for this assignment in our 2nd meeting together. 3. Collaborative seminar presentation (20%): Due on Selected Dates. In groups of four you will present on a specific primary work along with the music or secondary article assigned for that day (please see the schedule below for presentation dates). The group will not simply summarize the material. The presenters should assume that the class is familiar with the material (primary and secondary) since it is required reading. The purpose of the exercise is to identify key ideas from the secondary material and apply it to one of the assigned poems or chapters for that day. The suggestion is to spark discussion rather than tell the class what they should know. Open ended, thought provoking questions are encouraged. Didactic dissection of the text is discouraged. Creativity through media, performance, or whatever else is encouraged but not necessary. Please ensure that such creative ventures are tasteful and serve as learning aids rather than detracting from the material’s focus. All members of the group will share the presentation mark. Presentations will be graded based on clarity, comprehension, class discussion, analysis and (creative or interactive) approach. There will be a signup sheet on our 2nd meeting together. For instance, given that one of the lenses through which we are reading the writers of this course is their focus on social change, it might be appropriate to think of these creative interventions as having a public or community-facing dimension. Broadly, try to imagine how your creative intervention might move beyond the walls of academia and make an intervention in a broader community. Essentially, how might we take many of the tools we learn in academia (particularly in English Studies) to enact social change or challenge simple conceptions of the citizen? You may draw on local resources and social organizations, many of which are right here in Guelph, or you might simply relate to a larger web-community through a blog, a podcast, radio, or through some other media. It is not required for you to have a direct community-facing dimension to your project, you could simply write a poem, but I do want you to think and theorize about how the works studied in this classroom challenge us to move beyond a simple reading of them to some sort of enactment, however conceived. You will be graded on the level of engagement you put into your creative endeavor. It is for the above reasons that you are required to write a one-page (around 350 words) discussion of why the intervention was conceived as it was. You will also be graded on your ability to critically explain the efficacy and process of your “intervention.” I am also open to the idea of you collaborating with another student, although, like the seminar presentation, the grade will be shared. More details will follow in class. 60% of the mark will be for the creative piece and 40% of the mark will be for the analysis. There will be one closed book quiz on November 21st. Students will be asked to identify the name of a work and the author from unidentified quotations. You may write on the same text you presented on. The Long Essay will be around 5 pages in length, not including a Works Cited list. You are required to actively engage with three secondary sources in the body of this research paper—course material does not count. Please note that although secondary research is a necessary component of this assignment, your own ideas and engagement with these resources, rather than your ability to perform and incorporate research, will be graded. More detailed instructions, as well as possible topics, will be provided. I will be grading this assignment based on well-formulated and focused arguments. You are strongly encouraged to write an essay on a topic of your own choosing. * Prologue to Ralph Ellison’s Invisible Man. *Ch. 1, Pedagogy of the Oppressed assigned. Listening: Audio Reading from Clarke’s Whylah Falls. Overview of Group Presentation Marking Scheme. Listenings: Clip from interview between Paul Watkins, Katherine McLeod and George Elliott Clarke. *Clarke, Blue (poems: “Miles Davis: An Autobiography”; “Secret History”). Additional: “Cool Politics: Styles of Honour in Malcolm X and Miles Davis” by George Elliott Clarke. -Additional Content: Interview, Esi Edugyan in Studio Q. *Siemerling, “Transcultural Improvisation […] Wayde Compton’s Textual Performance” (CL). Compton talk on Hogan’s Alley. Jimi Hendrix’s Shrine in Vancouver. *Discussion/ display of Creative Interventions.